“As a proud son of Fermanagh, I have regularly praised DUP leader, Mrs. Arlene Foster, who is also a native of Fermanagh. … Despite political differences in Northern Ireland, county solidarity is still quite strong, especially in Fermanagh. In this letter published in the Irish News of Belfast, I gently question Mrs. Foster’s recent statement that, in the event of Ireland’s re-unification, she would leave Fermanagh and Ireland. That is something which the Founder of the DUP, Reverend Ian Paisley, MP, would never have done.” —Fr. Sean McManus. I had high hopes and nothing but good wishes for Arlene Foster, and was proud that a Fermanagh native had become first minister. I had the pleasure of meeting her several times over the years, before and after she became first minister, at Washington functions. She was out-going, friendly and gracious. This impressive lady is going to banish the unpleasant memory of the other famous Fermanagh unionist leader Basil Brooke (1888-1973), I remember thinking to myself. And, now, I find out that Arlene on her own words would do what Basil Brooke would never have done – flee the north if she does not get her own way. She says she would abandon those whom she leads when Ireland is inevitably united. Good gracious, a Fermanagh captain abandoning ship. Whereas Basil Brooke (who became prime minister 1943-1963) was in 1940 even prepared to ask Churchill to offer a United Ireland as the price of defeating Hitler and thus save the British Empire. Arlene, it appears, is prepared to do what Carson (a Dublin man) did – abandon Protestants. In the Carson case, the Protestants that were abandoned were in counties Donegal, Cavan and Monaghan. “We have to refer in these matters to Protestants and Catholics – we should only be making the very greatest camouflage of argument if we did not treat them in that way. On the other hand, while you would leave out 70,000 [Protestants]who are in these three counties [Donegal, Cavan, and Monaghan] you would bring in from these three counties into the northern province an additional 260,000 Roman Catholics.” (Edward Carson. Westminster, May 18, 1920). 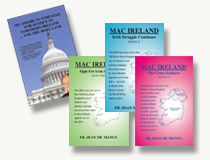 To get his own way, Carson in 1920 was prepared to sell out the Protestants of counties Donegal, Cavan and Monaghan. And, equally, the treasonous Carson in 1914 conspired with Germany to arm unionists to fight His Majesty’s forces. No wonder Teddy Roosevelt, who couldn’t abide traitors, declared Carson should have been shot by His Majesty’s government. Instead, Carson in 1915 was made attorney general in the British coalition government. And, now, Captain Arlene Foster is going to abandon the Good Six County Ship as the currents of historical necessity and modernity ineluctably steer it closer to the rest of Ulster, Connaught, Munster and Leinster. Would the late Dr Paisley, God rest him, ever have said he would abandon the people he led or would he have said: ‘Never, never, never’ ?